Just bask in that simplicity. The constant is the speed of light, which is a rather large number. In fact, light takes just over a second to travel to Earth from the moon, while the Apollo missions took three days. The fastest we’ve ever sent anything toward the moon was the New Horizons mission to Pluto, and it passed the moon after a little over eight-and-a-half hours. So, light is pretty fast, and therefore c2 is a gigantic number. The E and m in this equation are energy and mass, respectively. If we ignore the c2, which acts as a conversion rate, E=mc2 says that energy and mass are equivalent, and that things with mass have energy as a result of that mass, regardless of what they’re doing or where they are in the universe. This equation is at the heart of radioactive decay, matter/antimatter annihilation, and the processes occurring at the center of the sun. Now, that all may sound foreign, but it’s at work constantly, and we take advantage of it. For instance, positron emission tomography scans, or PET scans, are used to image the inside of the body using a radioactive substance that emits positrons (the antimatter counterpart to the electron). These positrons annihilate with the electrons in your body and release light, which is then detected by a special camera. This information is then used to reconstruct an image of your insides. 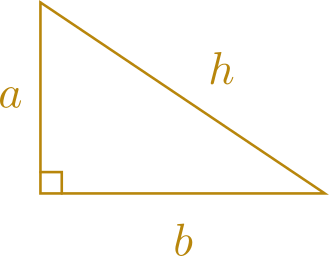 which relates the three sides of a triangle whose largest angle is 90°. (I’ve called the longest side h instead of c to avoid confusion with the speed of light.) 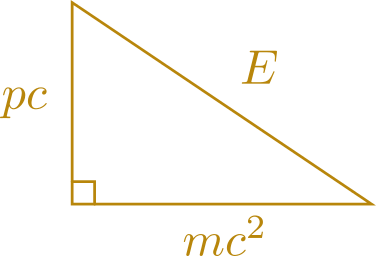 In our example, the total energy E is the longest side, and the “legs” are the rest energy (mc2) and the energy contribution due to momentum, written as pc. 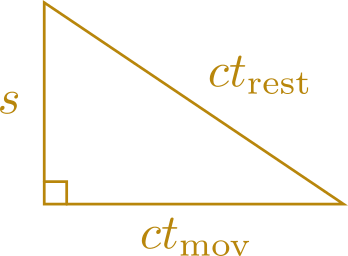 where tmov is the time elapsed according to a moving clock, trest is the time read by a clock at rest, and s is the distance that the moving clock has covered over the elapsed time. How can two clocks read different times? I’ll save that question for another day.